Saint Alphonsa Muttathupadathu, F.C.C., (19 August 1910 – 28 July 1946) was aCatholic Franciscan Religious Sister who is now honored as a saint, the first person of Indian origin to be canonized as a saint by theCatholic Church and the first canonized saint of the Syro-Malabar Catholic Church, an Eastern Catholic Church of the Saint Thomas Christian community. Alphonsamma, as she was locally known, was born in Arpookara village in the Archdiocese of Changanassery. She had a poor, difficult childhood and experienced loss and suffering early on in life. She joined the Franciscan Clarist Congregation, a religious congregation of theThird Order of St. Francis, and through them, completed schooling and made her permanent vows in 1936. She taught school for years but was plagued by illness. Claims of her miraculous intervention began almost immediately upon her death, and often involved the children of the convent school where she used to teach. The cause for the canonization of Sister Alphonsa began on 2 December 1953 in the Syro-Malabar Catholic Diocese of Palai and she was declared a Servant of God. She was declared Venerable on 9 July 1985 by Pope John Paul II. Her beatification was declared 8 February 1986 by Pope John Paul II at Kottayam. On Sunday, 12 October 2008, Pope Benedict XVI announced her canonization at a ceremony at Saint Peter’s Square. She was born in Arpookara, a village in the princely state of Travancore, which was under the British Raj at the time. Today the place is called Kottayam District, within the state of Kerala, India. Her parents, Joseph and Mary Muttathupadathu, named her Annakkutty (little Anna). She was baptized on 27 August 1910 at Saint Mary’s Church in Kudamaloor under the patronage of Saint Anna. Anna’s mother died when she was young, so her maternal aunt raised her. Hagiographies describe her early life as one of suffering at the hands of her stern foster mother and the teasing of schoolchildren.Anna was educated by her great-uncle, Father Joseph Muttathupadathu. When Anna was three years old, she contracted eczema and suffered for over a year. In 1916 Anna joined school in Arpookara. She received her First Communion on 27 November 1917. In 1918, she was transferred to a school in Muttuchira. In 1923, Anna’s feet were burnt when she fell into a pit of burning chaff; local hagiographies describe this as a self-inflicted injury in order to avoid her foster mother’s attempt to arrange her marriage, and fulfill her ambition of becoming a Religious Sister instead. This accident left her permanently disabled. When it became possible, Anna joined the Franciscan Clarist Congregation. She arrived at the Clarist convent at Bharananganam, Kottayam district, on the day of Pentecost, 1927. She received the postulant‘s veil on 2 August 1928. In May 1929 she joined the Malayalam High School at Vazhappally. Her foster mother died in 1930. Three days later she resumed her studies at Changanacherry, while working as a temporary teacher at a school at Vakakkad. On 19 May 1930 she entered the novitiate of the Congregation at Bharananganam and received the religious habit, taking her religious name of Alphonsa of the Immaculate Conception at that time. On 11 August 1931, she completed the novitiate and took her first vows. Sister Alphonsa took her permanent vows on 12 August 1936. Two days later she returned to Bharananganam from Changanacherry. She taught high school at St. Alphonsa Girl’s High School, but was often sick and unable to teach. For most of her years as a Clarist Sister she endured serious illness. In December 1936, it is claimed that she was cured from her ailments through the intervention of Blessed Kuriakose Elias Chavara, but on 14 June 1939 she was struck by a severe attack of pneumonia, which left her weakened. On 18 October 1940, a thief entered her room in the middle of the night. This traumatic event caused her to suffer amnesia and weakened her again. Her health continued to deteriorate over a period of months. She received extreme unction on 29 September 1941. The next day it is believed that she regained her memory, though not complete health. Her health improved over the next few years, until in July 1945 she developed a stomach problem that caused vomiting. She died on 28 July 1946, aged 35. She is buried at Bharananganam, Travancore (present day Kerala) in the Diocese of Palai. During the last year of her life she came to know the later-Bishop of Kerala Sebastian Valopilly, a priest at the time, who frequently brought her communion. This bishop became famous in Kerala for championing the cause of poor people from all religious backgrounds who had come to live Thalassery as a result of shortages elsewhere. He was also the person who reported the miracle attributed to St. Alphonsa’s intercession. The miracle attributed to her intercession and approved by the Vatican for proceeding with her canonization was the healing of the club foot of an infant in 1985. About ten years ago, when I was in a small village in Wayanad outside Manatavady, I saw a boy walking with some difficulty, using a stick. As he approached me I noted that both of his feet were turned upside down. I had a stack of holy cards in my pocket with Alphonsa’s picture on them, so I pulled one of them out and gave it to the boy. When I told the boy that he should pray to this woman for the cure of his feet, the boy-he was quite smart for a ten-year-old boy-replied, “But I’m a Muslim, and, besides, I was born this way.” I replied that God is very powerful, so let’s pray.A few months later,a boy and a gentleman appeared at the house here.I didn’t recognize them at first but soon learned that it was the Muslim boy with his father, here to tell me that his feet had been cured through their prayers to Sister Alphonsa. They showed me the calluses on the tops of his feet, and you could see the marks which had been made from the years of his walking with his feet turned under. Before they left, the three of us had our pictures taken. The boy had reportedly taken Alphonsa’s picture card and asked Alphonsa to help fix his feet. Several days afterwards one of his feet supposedly turned around. He and the other members of his family then prayed for the cure of the second foot, which also supposedly turned around later. The boy did not convert to Christianity. During the Apostolic Pilgrimage to India of Pope John Paul II, the Pope said as part of his speech atNehru Stadium, Kottayam, on 8 February 1986, that:On 2 December 1953, Eugène-Gabriel-Gervais-Laurent Cardinal Tisserant inaugurated the diocesan process for her beatification. Pope John Paul II formally approved a miracle attributed to her intercession and Alphonsa was declared Servant of God on 9 July 1985. She was then known as Venerable Sister Alphonsa. She was beatified along with Father Kuriakose Elias Chavara, T.O.R., at Kottayam. Pope Benedict XVI authorized Sister Alphonsa’s name for canonization on 1 June 2007, a process that was started 55 years earlier. She had been beatified by Pope John Paul II in 1986 in Kottayam, 40 years after her death, in recognition of the numerous miracles through intercessory prayers to her. The miracle that was attributed to her intercession and approved by the Vatican for canonization was the healing of the club foot of a Muslim infant in 1985 in the district of Thalassery of Kerala State. She was elevated to sainthood on 12 October 2008 by Pope Benedict XVI. The final ceremony for the canonization began on 12 October 2008 with the holy relics of Alphonsa being presented to the Pope by Sister Celia, Mother General of the Franciscan Clarist Congregation, the congregation to which Sister Alphonsa belonged. Sister Celia was accompanied by Vice Postulator Father Francis Vadakkel and former Kerala minister K. M. Mani, all holding lit candles. Speaking in English, the Pope declared Sister Alphonsa a saint, after reading excerpts from the Holy Bible. The Pope himself read out the biography of Alphonsa after the ceremony. “(Her) heroic virtues of patience, fortitude and perseverance in the midst of deep suffering remind us that God always provides the strength we need to overcome every trial”, the pope stated before the ceremony ended. Pope Benedict XVI also invited people “to pray for reconciliation and peace for some situations that that are causing alarm and great suffering,” specifically citing the civil war situation in North Kivu, Democratic Republic of the Congo, and “the violence against Christians in Iraq and India.” . The ceremony was attended by around 25,000 people of Indian origin – many waving Indian flags – as well as a large delegation from India. A 15-member official Indian delegation, led by Labour Minister Oscar Fernandes, attended the ceremony. With Sister Alphonsa being raised to the list of saints by the Vatican on Sunday, the Catholic Church in Kerala celebrated the canonization of the first Indian saint from an Indian Rite. Across the State, church bells tolled as Pope Benedict XVI named her St. Alphonsa of the Immaculate Conception. The cemetery where the Franciscan Clarist Sister was buried 62 years ago at St Mary’s Forane Church at Bharananganam has now been turned into the chapel which houses her mortal remains. The canonisation was greeted with the bursting of firecrackers and the toll of church bells. 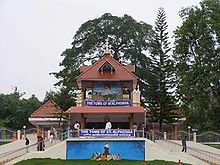 St Mary’s Forane church at Kudmaloor, the parent parish of the saint, also celebrated a special Mass. Thousands converge on the small town of Bharananganam when they celebrate the feast of Saint Alphonsa from 19 to 28 July each year; her tomb is becoming a pilgrimage site these days as miracles are reported by some devotees. 2. Practise your austerity in strict secrecy; it will fortify your spirit. 3. I desired to be ever faithful to Jesus. I would rather die than break this promise. 4. It is my beloved Spiritual Instructors who guided me to the threshold of Knowledge and enabled me to experience it, by training me to prepare and use each of them in the apt time. 5. By nature, I am affectionate; it seems that my whole heart is full of love. 6. I have love towards everyone. It is impossible for me to hate anyone. 7. My only desire is to love my Lord to perfection. 8. My Jesus is sufficient for me. I don’t want anything else. 9. How great is the joy experienced when everything is offered in the Sacred Heart of Jesus! 10. I will rejoice in whatever comes through the hands of my Jesus. 11. It is my strong faith that nothing shall ever happen to me without the knowledge of my Jesus. 12. I have completely abandoned myself to Jesus. Let Him do with me as He wills. 13. God in His infinite goodness has granted me the strength to preserve inviolate the sanctifying grace I obtained at my Baptism. 14. I would rather die than commit consciously even a trivial venial sin and thereby offend God.